Haven't updated my walkies map for a bit so here it is, updated to walks completed and in progress, January 2007. The orange outline is my target area, the solid orange is completed targets. I started in March 2005 and I'll complete all the walks in the outline within a year probably. Brisbane Water is part of Broken Bay. 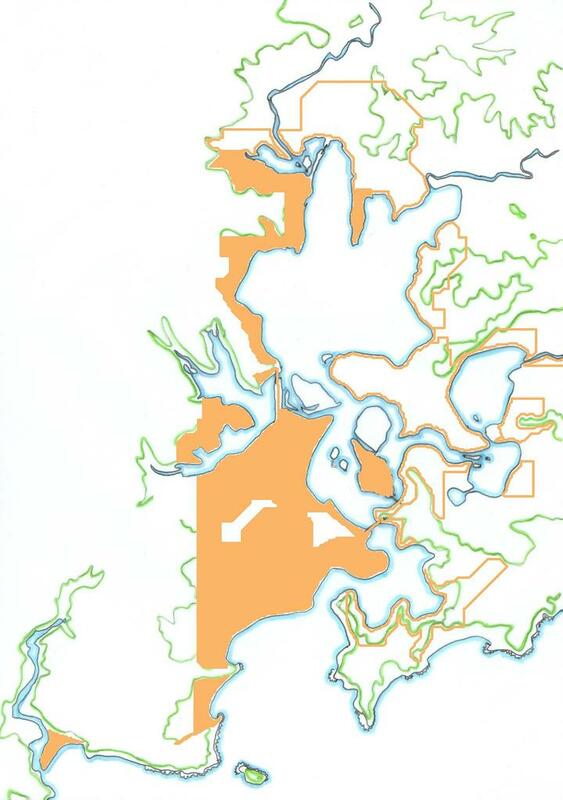 The Broken Bay heads are Box Head (BW side) and Barrenjoey Head (Sydney side). 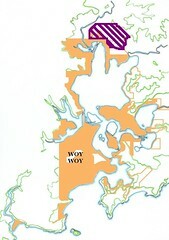 The other two parts of Broken Bay are Pittwater (between Barrenjoey Head and the Ku-ring-gai) and the Hawkesbury River. Below are all the names of my walkies targets, clockwise, around the Woy Woy Peninsula and around Brisbane Water, the estuary Woy Woy is on. [W] after a name means I've walked it. [PW] after a name means I've walked part of it. * after a name means it's an old or semi-official name for an area or it's an inhabited landscape feature like a bay or beach. Okay, we're all caught up now.